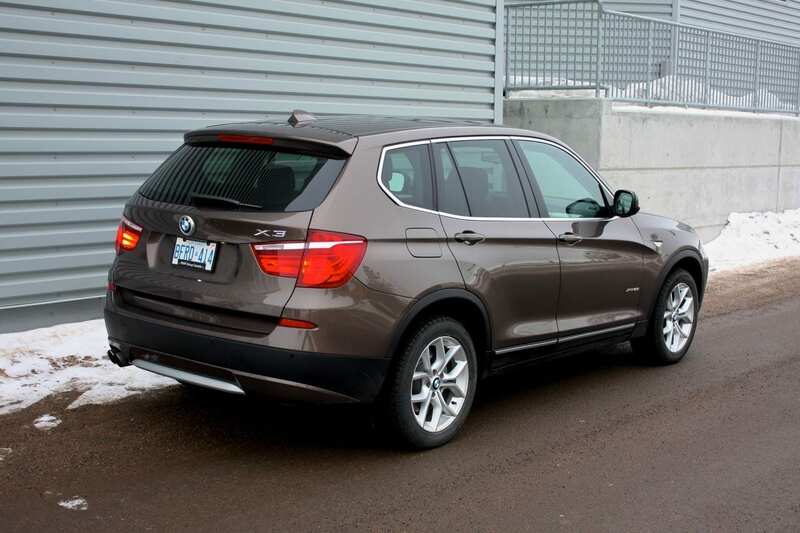 BMW’s in-betweener-sized utility vehicle sports good looks, good utility and a new engine for 2013. And don’t you worry – as you can see, it still proudly sports their horrifying naming conventions. 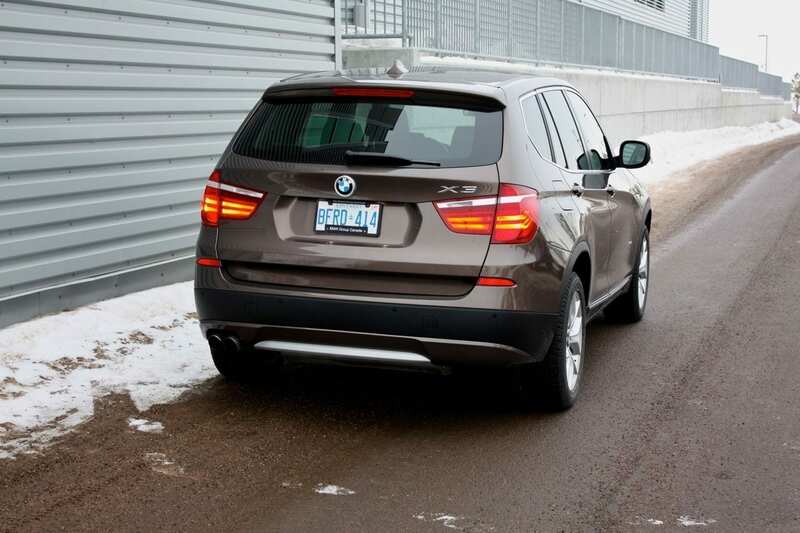 BMW launched this revised X3 with its smooth naturally aspirated inline-6. It was a good (but thirsty) engine, but since we’re headed into Turbocharged, Smaller-displacement Land, the 6 was swapped for their 2.0-Liter turbo inline-4. It cranks out 241 horsepower at 5000 RPM and 258 lb.ft of torque at a deliciously low 1250 RPM. The power makes its way through BMW’s 8-speed automatic, and on to their xDrive all-wheel drive system. All this to shlepp a 4,111 pound mid-size “sport activity vehicle” around town. 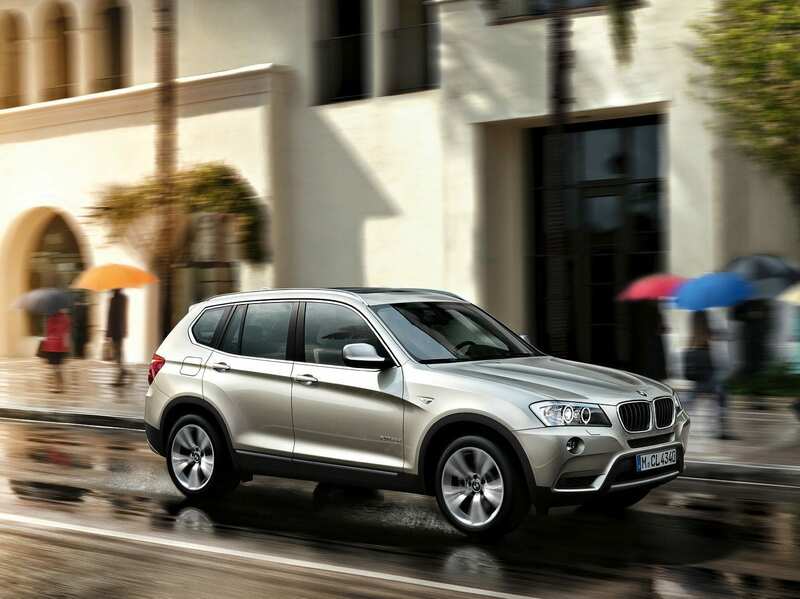 Fuel economy is acceptable – the X3 is rated at 9.7 L/100 km in the city and a very good 7.0 L/100 km on the highway. My week, spent mostly in the city, occasionally with a heavy foot, ended up yielding an average of 11.7 L/100 km. It’s a 67 Liter tank, and premium fuel is recommended. I talked to a few owners that say it runs perfectly fine on mid-grade. I was never a fan of the original (and evolved original) generations of X3s. But I feel that BMW got this one right. 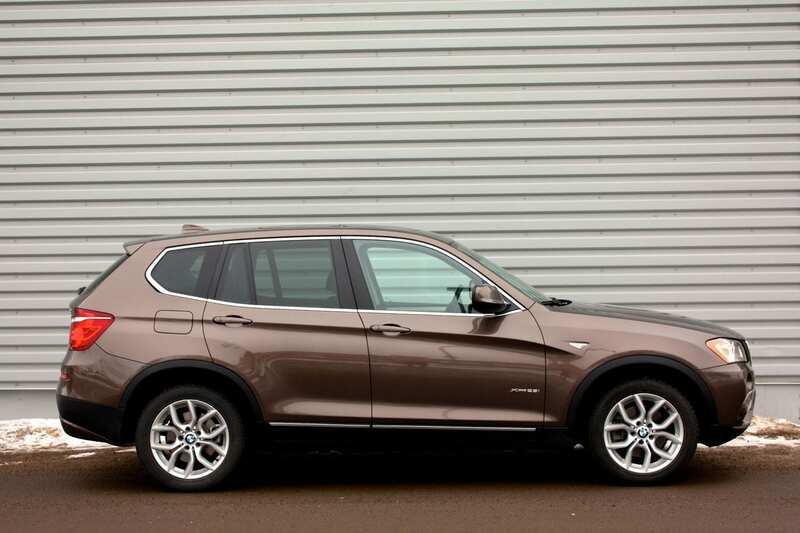 It’s very clearly a bigger vehicle – heck, it’s basically the size of the original X5. The dimensions, inside and out, are great. It’s not a compact vehicle, but it never feels like a monster SUV when you’re looking at it. 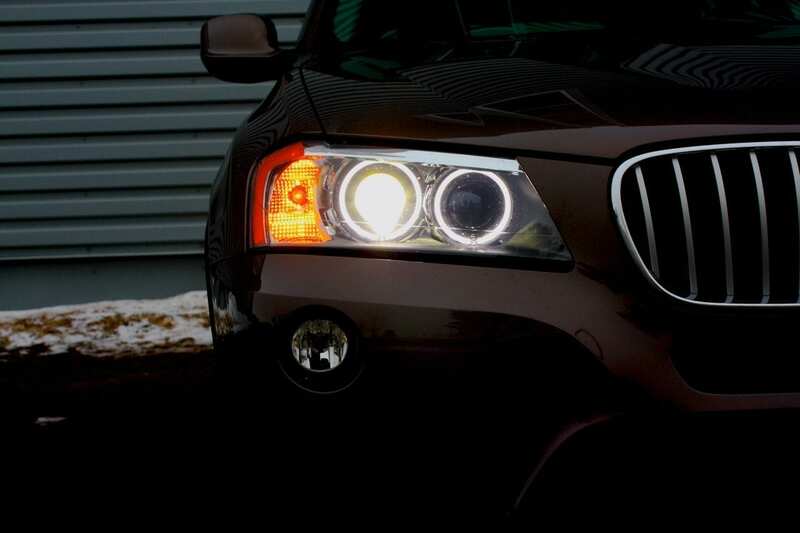 BMW’s instantly recognizable front end is well done, and I like the bright LED driving light haloes, or “coronas” as BMW calls them. 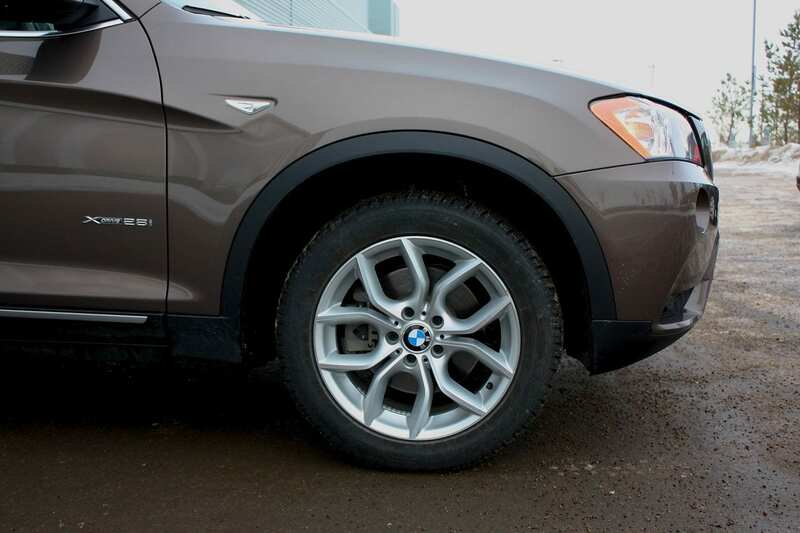 It looks as though more attention was paid to the surfacing work in the X3, and it came out looking confidently classy, without making too much of an effort to look tough or rugged. It appears that BMW went with a less-is-more approach and it is an elegant, clean design. The wheels are handsome too, although they look like they could use another inch in diameter. Here’s the biggest change, in my opinion. The roomy cabin offers substantial headroom and room to stretch out. It feels spacious – even more so, because of the enormous panoramic sunroof overhead. I found soft plastics everywhere, and on first inspection fit and finish appeared good. The space felt a bit dark , as this interior trim was the black one, but BMW does liven it up with some nice metallicized parts on the console and elsewhere. There’s remote unlocking and a push-start ignition. 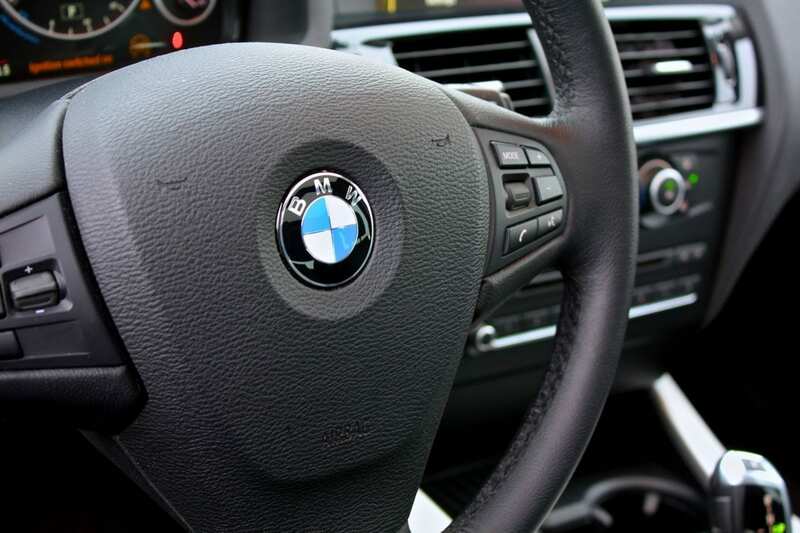 As I’ve come to expect in a BMW, you get a good steering wheel – it’s adjustable, heated, and has controls for media, handsfree, phone and cruise. Behind it sits a familiar pod of white-on-black gauges coupled with a high-resolution driver information system – the same as in the 328i. 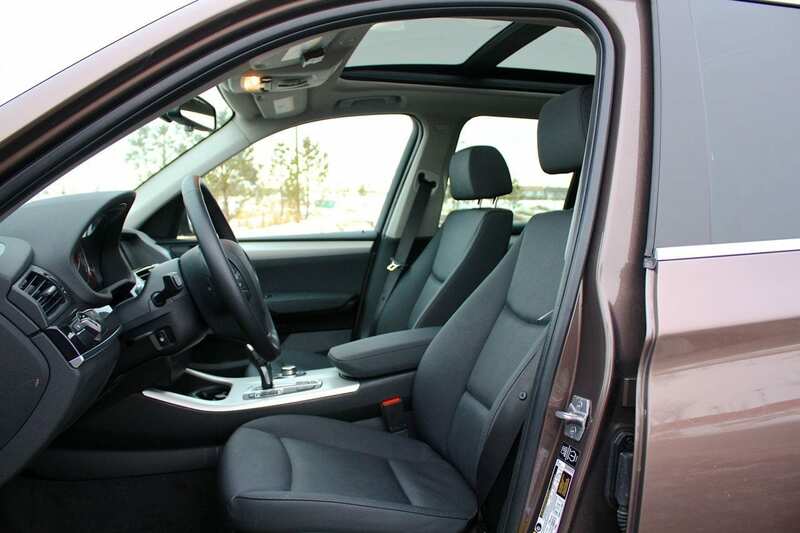 The heated, power-adjustable seats are very comfortable and offer good bolstering. In this trim, they’re upholstered with BMW’s unfortunate leatherette – it looks cheap to me. The strange mottled matte color and patterning isn’t convincingly natural to me, and almost everyone who got a ride commented on this too. BMW’s clear and sharp widescreen display sits in the upper dash, and it is managed by the somewhat confusing iDrive system – the controller and some hard buttons are located on the console. The sound system is alright, nothing great – it feeds off of AM, FM, CD, satellite, USB, auxiliary and Bluetooth streaming sources. 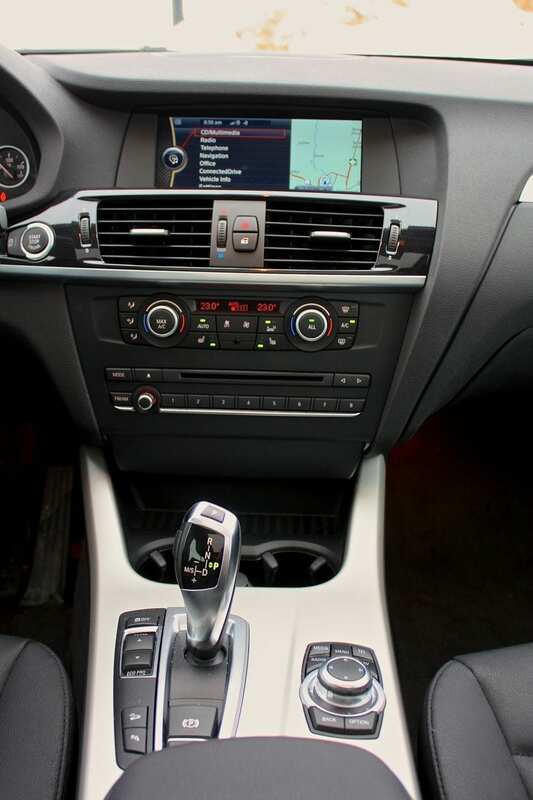 Below the screen, sits a dual zone automatic climate control system, and below that, some hard buttons and a CD slot. These seem strangely removed from the screen which controls the rest of the media goodies. The console houses two cupholders, a 12V plug, the strange shift lever (that you eventually get used to) and numerous hard buttons controlling drive modes, traction control, etc. If you’re looking for some back seat room, you’ve come to the right place. Getting into the back seats is very easy. You’ll find three seats, three seatbelts and three headrests here. The X3’s rear headroom is stellar for my 5’10” frame, as is the leg room. The two outboard seating positions are very comfortable. The middle seat is narrow, hard and raised and wouldn’t be a great place to spend a lot of time. In terms of convenience, you get adjustable air vents and a tiny storage cubby at the back of the console, and some great door bins. The middle seatback flips down to form an armrest with a clunky dual cupholder. Our three kids fit back there pretty well, and you get two sets of LATCH anchors for their seats. Storage around the cabin is pretty decent. There’s an open rubberized bin under the center stack, a decent space under the armrest lid (where you’ll also find the USB, auxiliary and 12V plugs, and excellent door bins. The glove compartment is tiny. Thankfully, the trunk is very big. 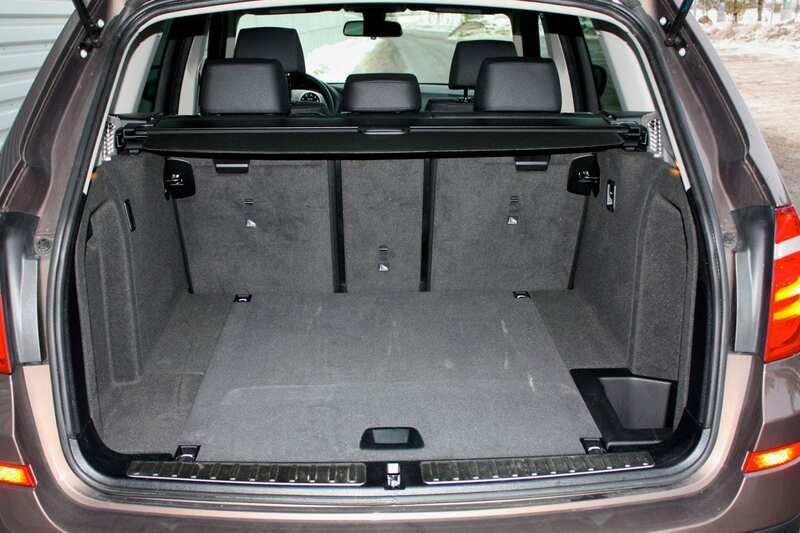 It offers 550 Liters of storage , and adds a little floor bin and some storage trays under trunk floor. 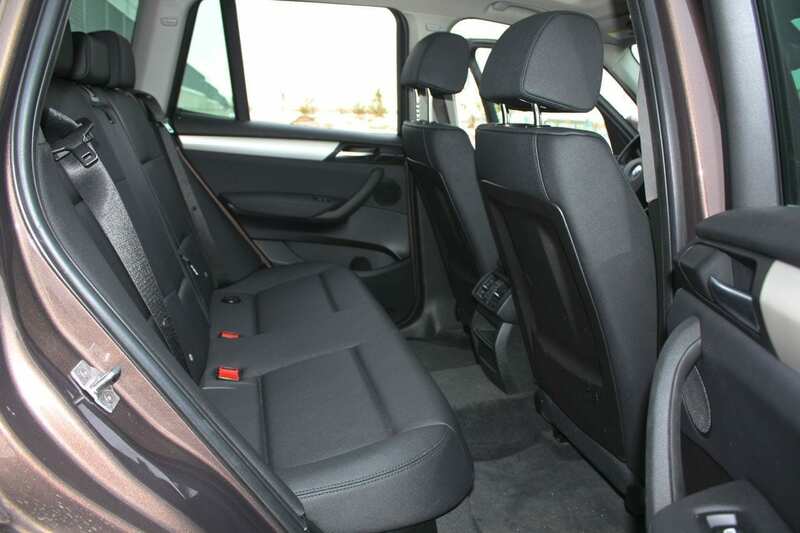 The rear seats split 40/20/40 to fold almost flat and leave you with a gargantuan 1600 Liter space for cargo. I’m particularly fond of how the middle seat folds down to become a pass through, leaving both outboard seats fully fnctional for passengers. Fantastic flexibility. The space is covered by a retractable, removable tonneau cover. 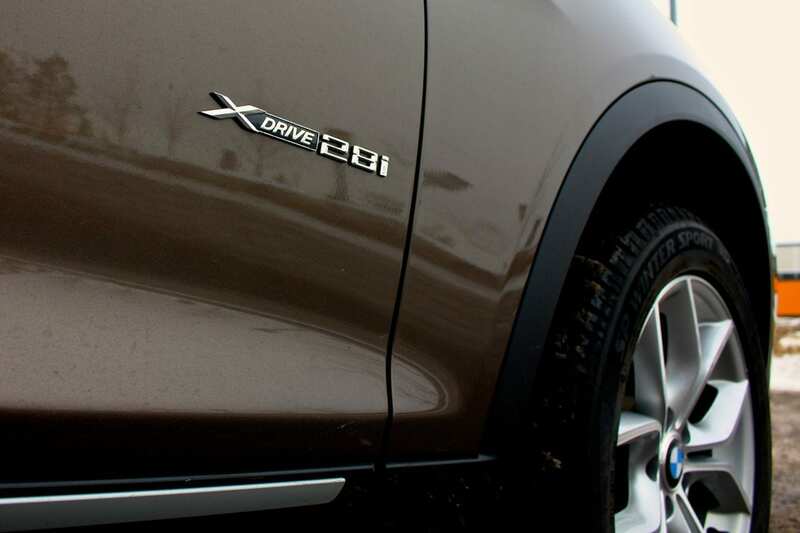 The X3 offers a nice driving experience. It’s not the ultimate driving machine, of course, but in this class, a good driving experience seems to be a rare find. 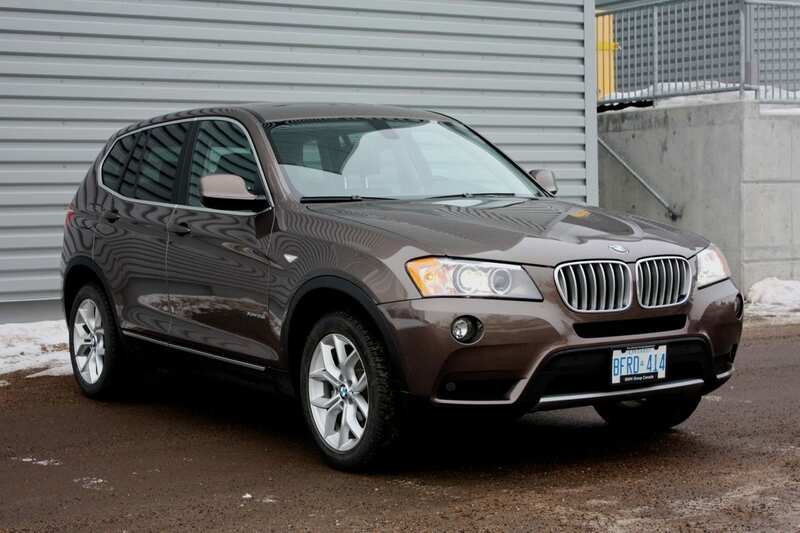 Especially because the X3 is a tad larger than its competition. The turbo engine is plenty powerful for everyday driving. Step on it, and you’ll notice some turbo lag but it spools up quickly and then it pulls hard and revs happily up to the top if you ask it to. I didn’t find any power drop-off either. 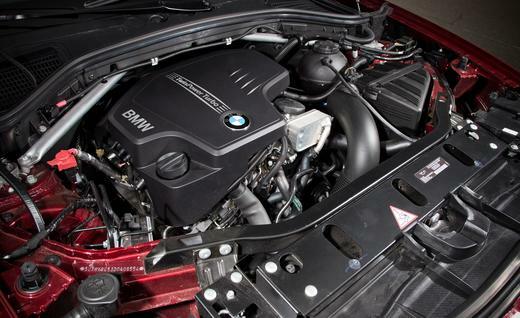 Unfortunately, this engine sounds terrible above a couple thousand RPMs – especially compared to BMW’s 6-cylinders. Though power is sufficient, I did feel that highway passing took a little more effort than I had expected. The 8-speed transmission is fantastic. It certainly hunts for higher gears to save fuel, but you can manually shift it (no paddles on the 4 cylinder though) or put it in Sport mode. It will map your acceleration more aggressively, holds those shift points longer and your steering response quickens. It’s an effective way to enjoy some sportier driving. There’s also an Eco mode, for the environmental weenies. BMW has added an auto start/stop function that shuts the engine off at a stop. I did not enjoy the rough restarts and thankfully this “feature” is defeatable. 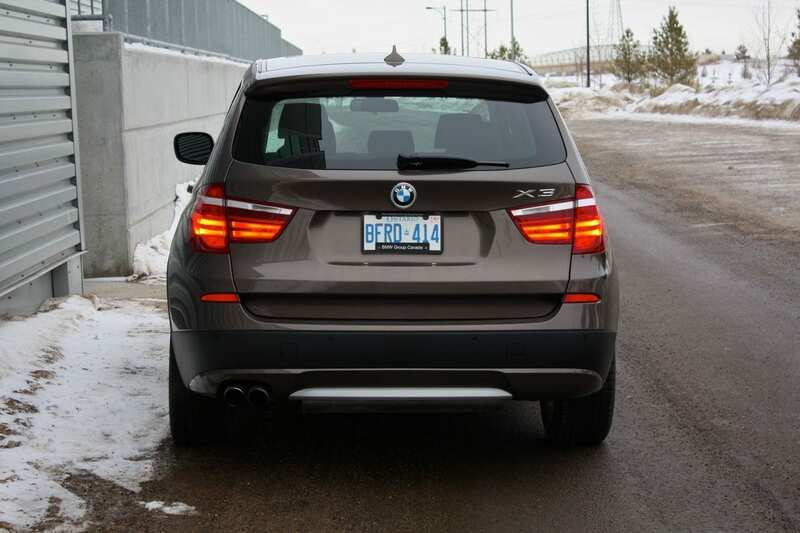 I found the X3’s variable torque split xDrive system to be quite effective in most situations, although it feels more utilitarian and less sport-oriented than some all-wheel drive systems. Which is fine, considering what the X3 is. The ride is firm, occasionally jiggly, but compliant enough to remain comfortable and it soaks up the big hits very well. Steering feel is surprisingly sharp and the vehicle responds nicely – I would say the steering is probably the best I’ve driven in this class. 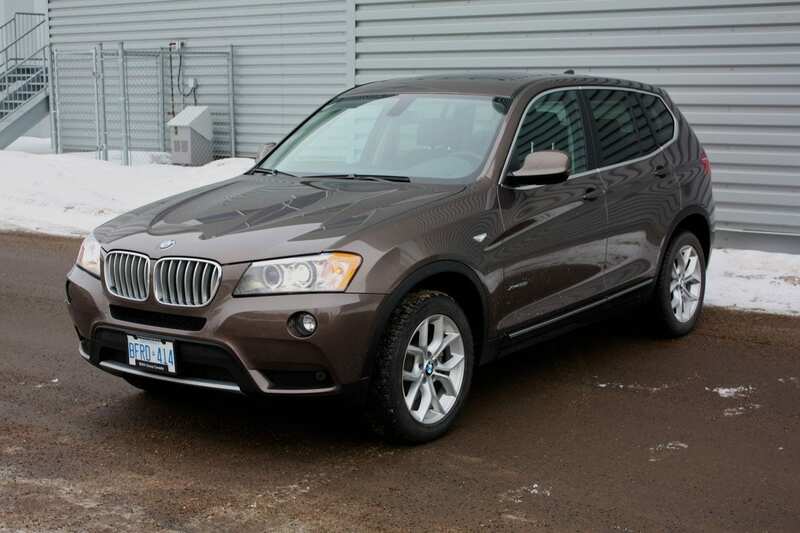 The X3’s handling is outstanding for this class of vehicle. I found the vehicle remained very planted, and although there’s some body roll around corners, it allows you to make quick moves on the road and it grips tenaciously in every situation. I never got the feeling that the X3 is a light-weight (it’s not!) but it feels heavy in a substantial way – it’s reassuring. Braking seemed a bit spongier than I’m used to with BMWs, but it came on powerful when needed. Visibility is pretty good. The back headrests are in your rear view, and that rear flank that sweeps up made me soil myself a few times when shoulder checking – it looks exactly like a vehicle’s hood is right there beside you. Things were generally quiet in the X3, but I did notice increased levels of noise on the highway – wind noise in particular. Nothing shocking for a utility vehicle. I like BMW’s dual-level traction control – one push gives you dynamic traction control that lets you have a few giggles, but kicks in before you hurt yourself. Hold the button for a few seconds and all the electronic grannies are turned off. You know. For fun. I am the kind of person that puts stuff in the back seats. My work stuff. My lunch. My bag. Whatever. The X3 auto-locks the doors, but does not auto-unlock. Not when you put it in Park. Not when you open the driver’s door. And that is just stupid. And irritating. Strangely, at this price, a power liftgate isn’t included. Remember I said that the fit and finish APPEARS to be quite good? Well, this was an essentially new vehicle. And there were a lot of creaks and rattles over road irregularities. They came mainly from the sunroof and emanated over every big bump or crack in an essentially new vehicle. That makes me wonder what it would be like with 50,000 kms on it. 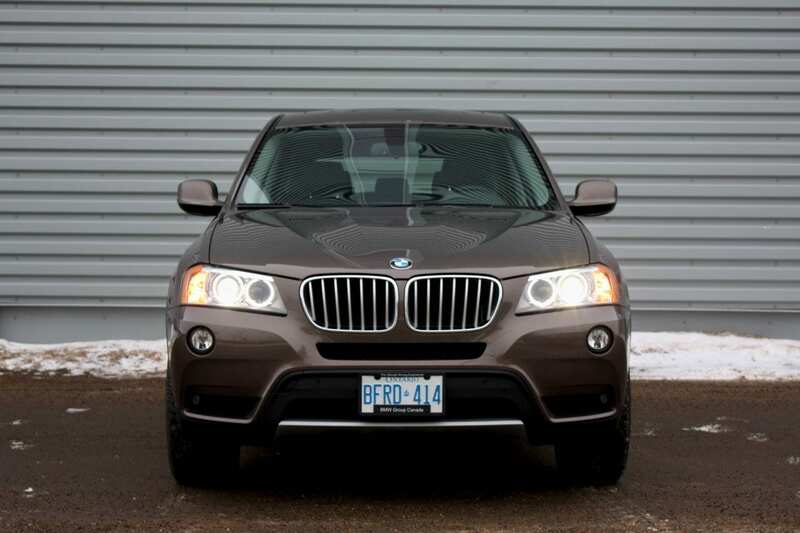 All in all, the BMW X3 is a fantastic vehicle. The size and cargo space make it a good choice for small families with plenty of flexibility. Add to that an engaging driving experience (especially for this vehicle class) and you’ve got a mid-sized utility vehicle that checks off a lot of boxes. You need to be careful with the options boxes though – start checking them off, and the price skyrockets in a hurry. WAF (Wife Acceptance Factor) was quite high. She enjoyed the driving aspect, and that it was easy to get into. She liked the space in the back, and the fact that she could shop for an entire day and not overfill the cargo space. She definitely noticed the squeaks and rattles though, and she’s not a fan of iDrive. Mind you, is anyone a true iDrive fan? I wouldn’t hesitate to add the X3 to a shopping list in this class. It offers a ton of utility, comes with a premium feel inside, great styling outside and does most things really well. Is it a good value? Nope. No BMWs are. As a matter of fact, you can get more for less. Depends on what you’re looking for. On another note, if this is more than you’re looking to spend, and you don’t need all this space, I also reviewed the slightly smaller, more affordable X1.